Today we release the Resurgence expansion, as well as some new features and balance changes! 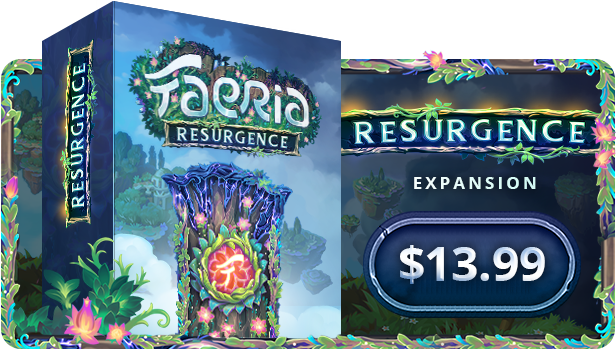 Faeria: Resurgence is now available on Steam! The Resurgence expansion contains 40 new cards split into two parts. The first batch of 20 become available immediately. Featuring new Red, Yellow, and Neutral cards. Hope for victory. A bitter celebration. Featuring new Green, Blue, and Neutral cards. Purchasing this content immediately adds a unique Avatar, Orb, and Card Back to your collection - as well as 5 Battle Chests containing only Resurgence cards! For a full list of currently revealed cards for Resurgence, click here. Today's update contains not only the release of Resurgence, but a set of new features and changes that will be available to all players of Faeria. At long last, many inhabitants in the world of Faeria have been given a voice. Many cards, including Sharra, Krog, and Rapala, will now speak when you play them - and sometimes more. We've teamed up with Team Four Star and Sound Cadence Studios to breathe more life into our game. We hope to continue to add more card-specific sounds as time goes on. See how many of the new voices you can spot! Have some friends you'd like to invite back to Faeria? We've made it a little easier for you, and you both will win out in the end! 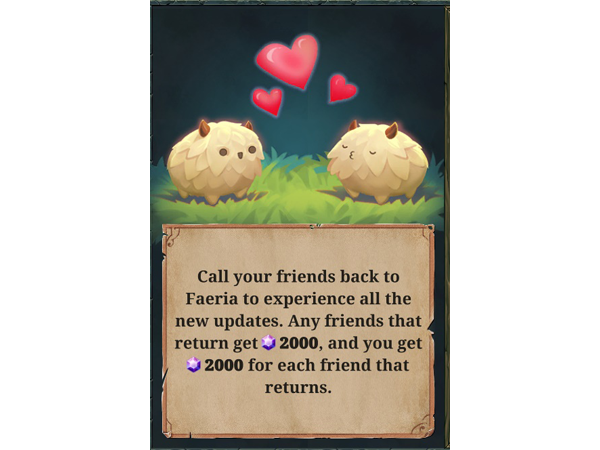 If you call a friend and they return to Faeria, you and every other player who invited them back will get 2000 gems! Which friends can I call back? They must be on your friends list. Friends are eligible to be recalled if they have not logged in since July 18th. They must have a validated email account, and bound to Steam. You can only call a specific friend one time. We're also applying several balance adjustments and tweaks to existing cards. This will now destroy creatures with a life value of 1. Stats increased from 5/5 to 6/6. Stats increased from 5/5 to 5/6. Faeria cost decreased from 6 to 5. Cost increased from 3 to 4. Land cost has been changed from 4 Wild to: 1 Forest, 1 Lake, 1 Mountain, 1 Desert. Faeria cost increased from 3 to 4. Stats reduced from 1/3 to 0/3. Stats reduced from 1/8 to 1/6. Is no longer a Beast. Deepwood Stalker, Voice of Truth, Sagami Grovecaller have had their wordings changed in order to reflect the fact you can cancel their ability. Mistral Guide now works consistently with all additional Dash effects. Both a creatures initial Dash and the Mistral Guide Dash will trigger. Rakoan Illusionist and Oradrim Fanatic wording and abilities have been changed to be cancellable. Rakoan Illusionist now properly only targets Rakoans. Rakoan Illusionist's token now has proper art. We're continually evaluating our progression and reward system, and have applied the following changes to both Ranked and Pandora season rewards. Seasons normally begin and end on the first Monday of every month. 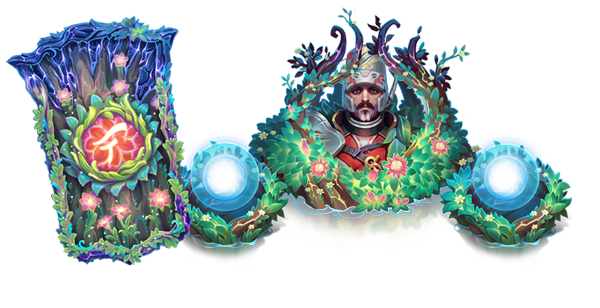 You will now receive the following rewards from reaching these amounts of Pandora Points per season. All rewards are cumulative. The top 64 players continue to receive the Golden Pandora Cardback. Ranked Season Rewards are now replaced with the following. All rewards are cumulative. Rank 0 (God Rank): Golden Cardback. This means that a God rank player will receive both Cardbacks, 3 Battle Chests, and 1 Mythic Chest in total. Thank you for playing Faeria! As always, feel free to ask us questions in our official Discord channel.